The idea behind custom-made orthotics is simple. Unlike generic, over-the-counter orthotics, our functional orthotics are individually designed for your unique postural problems — not just problems with your feet. We believe that correcting imbalances in your feet can properly align your spine and pelvis. From regular activities such as walking and running to more intense actions such as dancing and playing sports, the feet consistently absorb the force generated by body weight and gravity combined. And without proper support, your feet will be overwhelmed by the constant stress. We’ll take dozens of measurements from each foot to customise the orthotics to you. A scan is done by standing on a machine that measures your foot and produces a digital image. This image is turned into data to assess how your feet are functioning. 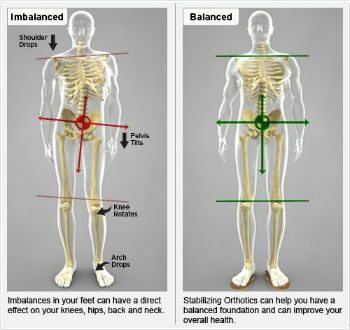 Ensure better posture and support chiropractic adjustments by getting orthotics made specially for you. The feet are the most abused parts of the human body. Did you know that all three arches in the foot affect the nervous system? There’s also support to show that if you’re in a stressed state with the processes turned on for the fight-or-flight response, customised orthotics will help your stress hormone levels drop. You can think of it as an easy way to feel calmer. Additionally, orthotics may help you improve your athletic performance. Contact us today to find out how orthotics may help improve your health!